Just as its namesake personifies a progressive style of play, the Nike Air Zoom KD9 represents the evolution of basketball footwear. In response to Kevin Durant’s trademark versatility and impressive court coverage (approximately four miles a game and 15 marathons a season), it offers support, comfort and responsiveness via the most advanced construction of Nike Flyknit and Zoom Air technologies to date, adapted to basketball’s specifications. This aerial view of Durant’s in-game motion shows his versatility and sweeping range expanding the entire basketball court, which equates to approximately 15 marathons in a season. 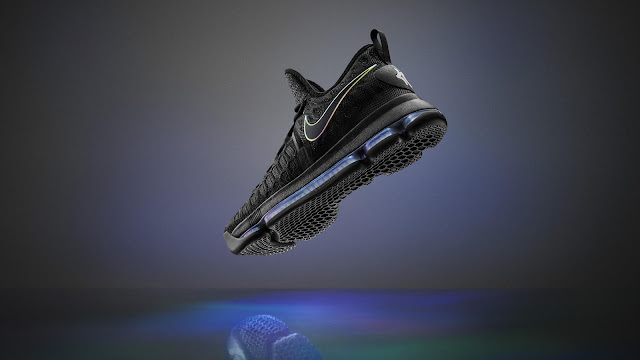 Designed by Leo Chang, the low-cut shoe features a Flyknit upper engineered down to the pixel for maximum containment. Specifically, it features a pattern with a distinct honeycomb structure precisely knit for the multidimensional movement of basketball and Durant’s lateral quickness. Flyknit technology engineering locks down the forefoot while still allowing the foot to move naturally. Flyknit’s efficient material use also ensures the upper is lightweight, without compromising strength. A visible, tapered Zoom Air unit runs from heel to toe, marking the evolved Air bag’s debut in basketball. Developed over three years of advanced wear testing, the new Zoom Air unit — filled with fibers that compress upon each step, then spring back for unmatched response — is 16 millimeters thick at the heel and progressively narrows to 10 millimeters at the forefoot. This architecture is tuned to provide maximum impact protection while amplifying the bouncy feel of the Zoom Air unit. Moreover, the midsole is minimized to enhance the responsive sensation produced by the Zoom Air unit. It also is articulated with anatomical flex groove strategically placed in the forefoot to maximize natural transitions, whereas heel notches add stability to lateral movements. The KD9 is available globally for athletes of all ages, from toddler to adult, beginning June 20. To become a Nike+ member and sign up for notifications about the Nike Air Zoom KD9, go to Nike.com.